Morgan Hill, CA – February 20, 2015 – Volanti Displays, a Silicon Valley company that specializes in large screen LCD displays will demo their innovative products at Mobile Beat Las Vegas on February 24-25 at the Riviera Convention Center, Las Vegas, NV. One product of particular interest to DJ’s and live performers is The Cube, a unique 3-D display that wowed audiences at the National Association of Music Merchants (NAMM) show in Anaheim, CA, last month. “The Cube will definitely be the coolest LCD display in 2015. Looks like a door to another dimension,” said Amp Live, a leading Beat Maker/Producer who helped test The Cube in a recent live performance. Designed for DJs and performers who want to bring an exciting new element of visuals to their production. Measuring 21” on each side, The Cube displays high-resolution 1920×1920 video on multiple sides. The display quality is incredible, consisting of LCD panels using LED backlight IPS technology. 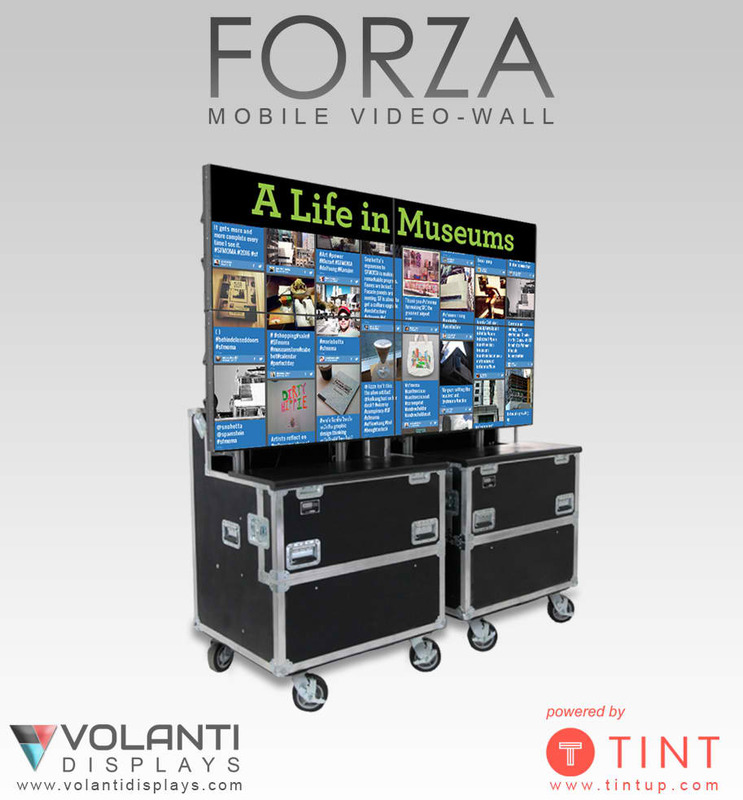 Also on display will be Volanti’s FORZA family of mobile video walls. FORZA products require no custom setup, are durable, and can be ready to go in a matter of minutes. Perfect for any venue. Demos of The Cube and FORZA will be ongoing at the Volanti Displays Mobile Beat booth #521 from 2 -7 pm on February 24 and 2 – 8 pm on February 25. For additional information contact James Henry at 408-828-6739 or at james.henry@volantidisplays.com. Founded in 2014, Volanti builds on over 25 years of display industry expertise and focuses on large display systems for niche commercial markets. Innovative products and cutting-edge technology combined with design and final assembly in the USA. This entry was posted in Cube, Forza, video-wall on February 20, 2015 by admin. Morgan Hill, CA – January 14, 2015 – Volanti Displays, a Silcon Valley company, will be unveiling the FORZA 4K 84” Mobile Touch Screen at the 2015 NAMM show, booth #7427, Anaheim Convention Center, Anaheim, CA. 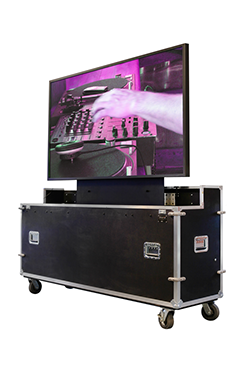 Performing artists and DJs will love the ability to incorporate graphics into their performance with touch screen capability. “The opportunity to bring your audience into the music is amazing,” said Billy Barnes, Art Director of Volanti Displays. “With the phenomenal resolution of this 4K video display you’re guaranteed to bring high impact to any stage show,” Barnes added. The Forza 4K 84” touch screen is the latest addition to the FORZA family of mobile products. As a single large LCD display the FORZA can be set up by one person in a just few minutes. After rolling into place, simply pull the handle and the screen rises out of the rugged mobile cart. Simple setup, serious impact! Visitors to the show are encouraged to stop by Volanti’s booth #7427 and try out the FORZA touch screen using Ableton Live and Super Looper. Anyone is welcome to drop beats, mix tracks and be your own producer. Morgan Hill, CA – November 5, 2014 – Volanti Displays, a Silicon Valley company who specializes in large screen displays, including video-wall systems, recently looked at creative ways to use social media in museums. Every exhibit can include a ready-made hashtag to make it easy for visitors to post messages on Twitter, Instagram, Facebook, Pinterest, and other social sites. For areas in a museum where photos are allowed, signage suggesting a photo op or ‘selfie station’ can also encourage social posts and increase the museums digital presence. The use of a Social Media Wall allows visitors to congregate for real-time viewing. It encourages the audience to share thoughts and instantly see what’s being posted on a topic or hastag. A video-wall is an ideal vehicle for creating a Social Media Wall. Video-walls are fixed or mobile video screens that can incorporate visual displays as well as social media. Software is available which aggregates multiple social media platforms. Another way to increase visitor participation is rental of low cost tablets customized with cameras and apps that upload to social media feeds. This entry was posted in Social Media, video-wall on November 5, 2014 by admin. Morgan Hill, CA – October 22, 2014 – Volanti Displays, a provider of large display systems, today released a video commercial for the first-of-its-kind Forza mobile video-wall. The commercial highlights the unique nature of the Forza unit. The innovative and easy to use Forza mobile video-wall provides a brilliant 94” or 110” display, packed in two rugged wheeled carts that are also used as the base and frame. Simply roll into place, release the gas-spring mechanism, and the top display and frame rises automatically. Add the lower display and plug in the wiring. With that you have a transportable video-wall solution, ready to go in a matter of minutes. The mobile video-wall is ideal for meetings, trade shows, fundraisers, museums, galleries, corporate lobbies, educational venues, or anywhere you might want to engage your audience and bring a visual message to life. For additional information contact Michael Sarich at 408-579-1622 or at michael.sarich@volantidisplays.com. This entry was posted in Forza, video-wall on October 23, 2014 by admin. Volanti Displays has enhanced its Forza Mobile Video-Wall with a limited time offer of a free Full-HD media player with every Forza purchase. The media player is conveniently stored within the Forza mobile unit for easy use. The ingenious Forza video-wall delivers a brilliant 94” or 110” display, packed in two rugged mobile carts that transform into the stands. Simply roll in place, pop up the gas-spring mechanism and connect the pre-configured wiring, a complete video-wall in a matter of minutes. The Forza has wowed the crowd at a recent facilities expo. “People kept coming back for a second look,” said Michael Sarich, Business Development Manager for Volanti Displays. “Having a totally self-contained, transportable video-wall solution, ready-to-go in a matter of minutes, is quite unique,” added Sarich. The transportable Forza video-wall is ideal for meetings, trade shows, fundraisers, museums, galleries, retail spaces or anywhere you might want to engage your audience. This entry was posted in Forza, video-wall on October 20, 2014 by admin. Morgan Hill, CA – October 15, 2014 –Volanti Displays recently announced a unique offer for customers purchasing the Forza mobile video-wall. Every Forza purchase includes a one-month trial of TINT’s Premium service ($1,000 value). The ingenious Forza video-wall delivers a brilliant 94” or 110” display, packed in two rugged mobile carts that transform into the stands. Simply roll in place, pop up the gas-spring mechanism and connect the pre-configured wiring. There you go — a portable video-wall solution, ready-to-go in a matter of minutes. TINT’s unique platform, which displays social media feeds, is a perfect compliment to the Forza mobile video-wall. “TINT is thrilled to embark on a partnership with Volanti to combine the next generation in mobile video screens with the social media world. TINT’s technology combined with Volanti will enable anyone to pop up a social media activation to spread their message to mass audiences in less than 30 minutes,” said Brandon Ancier, TINT’s Director of Growth. The new Forza mobile video-wall is designed for events where portability and rapid set-up is essential. Trade shows, sporting events, corporate trainings, weddings, fundraisers, roving museum exhibits and educational venues are just a few examples of where a mobile video-wall can bring a visual message to life. “TINT, together with the Forza mobile video-wall, brings one of the most powerful forms of engagement – social media – to any event,” said James Henry, CEO of Volanti Displays. TINT can pull feeds from over 10 social networks, including: Twitter, Google+, Facebook, Instagram, Pinterest, Vine, LinkedIn, Youtube, RSS feed and Tumblr. This entry was posted in Forza, Social Media, video-wall and tagged Tint on October 15, 2014 by admin. 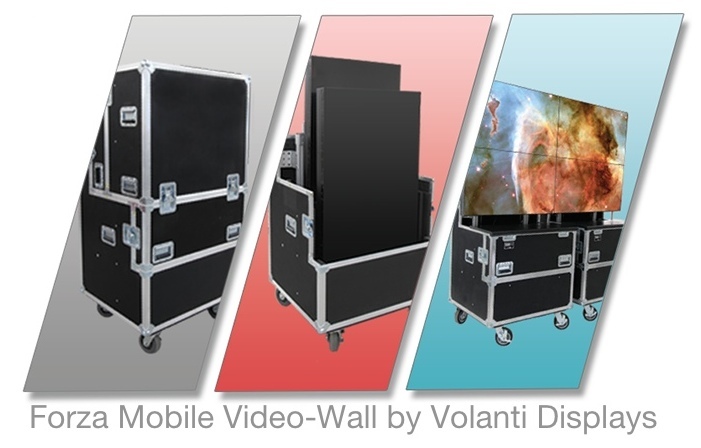 Morgan Hill, CA – October 13, 2014 – Volanti Displays new innovative product, Forza Mobile Video-Wall, is changing the way companies display their products at shows and events. The Forza can boost your presence at trade events by bringing a powerful visual message to any target audience. “In the past, only large companies, with deep pockets, could afford an attention getting video-wall at events. The Forza mobile video-wall has changed that,” said James Henry, CEO of Volanti Displays. “it is literally easy enough for the event team to set-up themselves within 20 minutes’. Quick set-up and take down, in a minimum amount of space, is what really makes this video-wall such a unique product. The mobile unit is delivered in robust wheeled carts that transform into the base and frame. In less than 20 minutes a complete 94” or 110” video wall is ready to use. Forza display monitors offer full HD, IPS technology–brilliant color with superb viewing angle. Visitors crowding around your trade show booth or event will be able to view your display from wide angles. Volanti Forza, an on-the-go, big screen solution. This entry was posted in Forza, video-wall on October 13, 2014 by admin. Morgan Hill, CA – October 9, 2014 – Volanti Displays announced today a unique solution for bringing video-wall technology to any venue. The Forza is the first of its kind mobile video-wall unit. The Forza mobile video-wall is delivered in wheeled carts that transform into the base and frame. In less than 20 minutes a complete 94” or 110” video-wall is ready for use. “In the past, video-walls were not something that could easily be put up or taken down,” said James Henry, CEO of Volanti Displays. “We know digital signage and messaging is a powerful tool. We wanted to develop a product that was mobile and easily accessible,” added Henry. The Forza offers LCD technology in models for both indoor or outdoor usage. It has an ingenious gas-spring mechanism, which makes for an easy ‘pop and show’ video-wall. The wiring is preconfigured and straightforward and the industrial strength wheels make moving and positioning easier than ever. The mobile video-wall is ideal for business meetings, trade shows, trainings, fundraisers, museums, galleries or anywhere you might want to engage your audience. This entry was posted in Forza and tagged Forza mobile video-wall on October 9, 2014 by admin. Volanti Displays – founded in September 2014 – Press Releases will be posted to this address as they are issued. This entry was posted in Uncategorized on October 8, 2014 by admin.